Thomas Park of the Warren Artists’ Market (WAM) declared the First Friday Poetry Night in June to be a tribute to the memory of Maya Angelou; a great idea for a great lady who influenced many people in her lifetime. Several folks read a poem or two of hers. 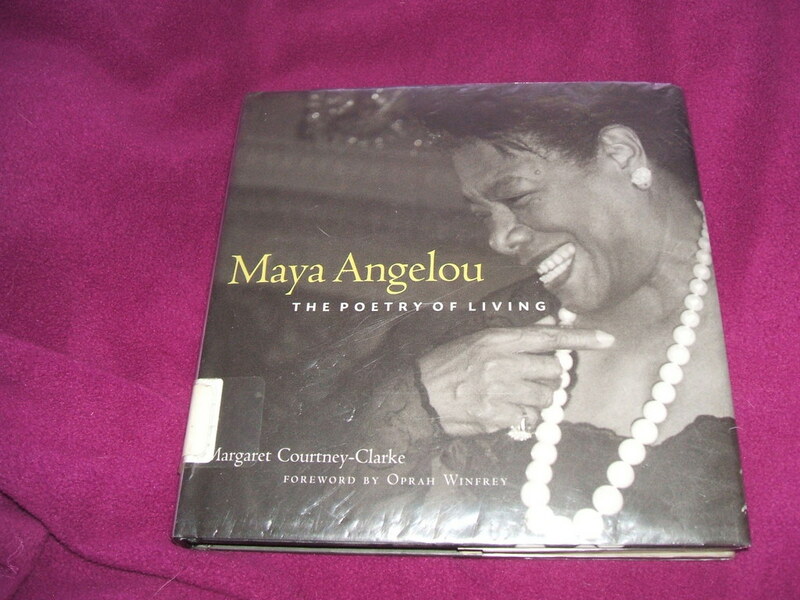 I had just recently taken “Maya Angelou: The Poetry of Living” by Margaret Courtney-Clarke out of the library, so I brought it along. In the book there are over a hundred pages of comments from people whose lives she touched, along with a few comments of her own. To accent my chosen readings from the book, I added two poems that touched me especially. “Alone” was one and the other “Touched by an Angel” surely she had personal experiences with both. Sterling added some soft jazz in the background and gave us all a special treat by playing a recording, bringing Maya Angelou’s voice right into the room with us! A delightful experience! Maya cooked with words of all varieties. She also was a kitchen cook. Reading her cookbooks, The Welcome Table and Great Food, All Day Long, etc. that sit on my cookbook shelves, are filled with recipes for elegant dining, the best recipes for leftovers, and a running conversation. They make me feel as if she is in the kitchen with me. A blessing and a comfort, indeed. I hope she got her cool drink of water before she died. I gave up a chance to paint with friends one day last month because I knew I’d been postponing writing the next chapter in a memoir, written strictly for healing purposes. The Past kept burning me to get out of the place I had buried it so many years ago. Like the characters in my Major Fraser book that would not let me sleep at night until I told their story. So I gave up the beautiful day for painting and stayed inside, on my PC, and wrote, and wrote, and wrote; only taking time out for nibbles and water from the kitchen. These trips to the kitchen help keep my lower back from protesting the hours at the PC. Lizzie came after me, pawing at my elbow at 3 o’clock. She wanted me to join her in our loosely scheduled reading time. “Not today, Lizzie” I told her. “My muse is hot and my fingers nimble. I’m cranking.” She looked properly disappointed but understood. She’s a witness to me on a writing hailstorm. It’s a half hour before midnight and I’ve completed the chapter. I’ve wept, dried the tears, and kept writing. I feel great now. A good cleansing made me feel lighter. The memoir is near completion and I’d like to get back to some kind of normal life, for a while anyway. Maybe do some planting if the season has not passed me by . . . cut the grass… clean the house… all waiting for me while my memories were unloading onto the paper.